pop-ups, retail architecture, brand communication, and event management. Welcome to JUSTSO. We specialise in retail design and events for luxury brands that engage, intrigue, and inspire – right down to the very last detail. As an award-winning creative design agency, JUSTSO work with the world’s leading luxury brands to devise and bring to life full-service solutions for a wide variety of creative briefs. Always crafted with care, and expertly tailored for the brands we work with, our designs and events are born out of skill, collaboration, and meticulous attention to detail. Founded by industry veteran Stuart Henry, JUSTSO has been delivering inspiring brand experiences for more than a decade. Bringing together expertise in design, logistics and project management, we craft seamless brand stories on a global scale. Innovation is at the heart of everything we do. In an ever-more competitive retail landscape, JUSTSO creates experiences that stay true to a brand’s heritage, while always looking towards the future. our brand partners on every step of theirs. Luxury is in the details. That’s why JUSTSO is passionate about perfecting them. No matter the size of the project, our team goes above and beyond to ensure that every last detail is just so. of innovative technologies, or the beauty of a new material; towards rich design. At JUSTSO, we seek to enchant and wonder. The details let us do just that. We offer a bespoke concierge style service and, if required, take full accountability for your event. [post_content] => We offer a bespoke concierge style event management service for corporate and luxury events. Design for luxury brands is at the core of our business, so we understand the aesthetic and intricate detail required for the production of your luxury or corporate event. We provide every client with a tailor-made service which is designed to ensure that your event is a unique and unforgettable experience. Whether it’s a conference or launch event, we operate globally in order to achieve memorable events with our clients. We have an innate understanding of the expectations of the luxury delegate and strive to create an experience that will be unique and unsurpassed. We combine innovative conceptual ideas with an attention to detail which will fully ensure that your event will delight your guests, and offer your teams peace of mind that every conceivable detail will be taken care of. We approach event management as if we were organising an event for our own brand. We work closely with you to make decisions clear and concise. We can also take full accountability for your event, from ideation, planning, sourcing all the way to event coordination on the day. We strive to create an experience your delegates will never forget. We won’t ever lose focus on your event objectives. Whatever your overarching objectives, when you are arranging an event, we understand that you need to ensure that your clients have an enjoyable experience that will last in their memory. 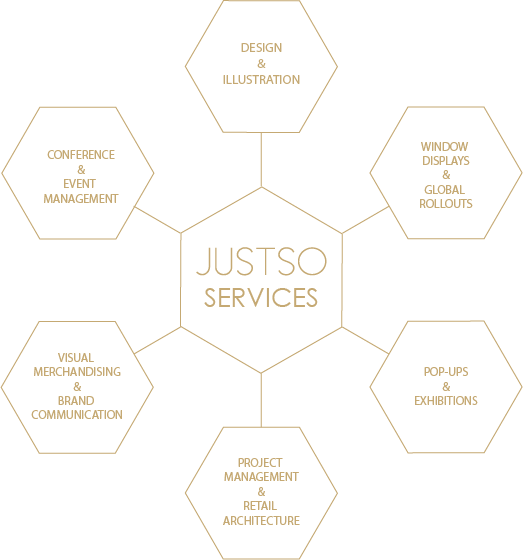 JUSTSO are experts in luxury design. Our experience of creating spaces which are designed to drive engagement is applied to our events, to ensure that the flow and atmosphere meets your objectives. [post_excerpt] => We offer a bespoke concierge style service and, if required, take full accountability for your event. We offer a bespoke concierge style event management service for corporate and luxury events. JUSTSO are experts in luxury design. Our experience of creating spaces which are designed to drive engagement is applied to our events, to ensure that the flow and atmosphere meets your objectives. [post_content] => As a creative agency, design is at the very core of our business. Whether we are bringing a pre-existing conceptual idea to a visual viewpoint or, developing a full concept with a solution in-mind for your brief – our team will produce the inspiration to motivate your project and bring your vision to life. [post_excerpt] => As a creative agency, design is at the very core of our business. Whether we are bringing a pre-existing conceptual idea to a visual viewpoint or, developing a full concept with a solution in-mind for your brief – our team will produce the inspiration to motivate your project. [post_content] => A JUSTSO, our outstanding reputation in shop window display design has allowed us to build an extensive portfolio on word-of-mouth and repeat clients. We have worked with most of the leading luxury brands across fashion, ﬁne jewellery and luxury cars, resulting in some of the most prestigious window display projects within the industry. Offering a fully tailored service, we will become fully immersed in your brand and will sculpt your window displays from the inception of through to installation. [post_excerpt] => Our reputation in windows displays, has allowed us to build a portfolio on word-of-mouth and repeat clients. We have worked with the majority of leading luxury brands across fashion fine jewellery, and luxury cars. [post_content] => Developing an identity in relation to the DNA of your brand can be challenging. At JUSTSO we aim to communicate the desirability of your products in a retail space. We understand that your brand identity is crucial and that even the shade of a particular colour used can make a big difference to the success of your products or services. Our holistic approach allows you to weave your brand throughout every customer touchpoint from temporary pop up structures to your online presence, and throughout your stores. As a leading retail design agency, we will unlock the key to your brands success. JUSTSO’s team of expert designers understand the nuanced and minute details which can make or break your brand story. We are fully adaptable to work alongside in-house visual merchandising or design teams but can also take full accountability for clients who do not have the additional resources internally. In an increasingly digital world, your retail branding is about so much more than bricks and mortar stores. Our innovative solutions can seamlessly blend the online and offline shopping experience, creating a cohesive brand DNA which flows throughout the entire customer journey. Supporting across a variety of mediums, such as brand guidelines, product brochures, brand development or even store launches, we are conﬁdent that we can help discover your brand identity. Our insightful teams will offer full support in creating in-store experiences which tell your brand or product stories. From compelling window displays, designed to drive footfall, to ensuring you interior layouts drive the sales of key products, we have the expertise to unlock the potential of your retail spaces. [post_excerpt] => Developing an identity in relation to the DNA of your brand, can be challenging. We have intentionally and at times even unintentionally, introduced brand identity across our portfolio of projects. Recognition of your brand is crucial, whether it be a logo or, even the shade of a particular colour. Developing an identity in relation to the DNA of your brand can be challenging. At JUSTSO we aim to communicate the desirability of your products in a retail space. We understand that your brand identity is crucial and that even the shade of a particular colour used can make a big difference to the success of your products or services. [post_content] => Acting as brand guardians for the management and procurement of your project, we become your brand’s retail architects to create and launch creative retail projects that meet with your core objectives. [post_excerpt] => Acting as brand guardians to the management and procurement of your project. We pride ourselves on operating as a small team, in order to give you the bespoke service that is often required with many of our clients. Utilising a pop-up shop or exhibition can be an innovative platform to create drama around your brand. But, consideration of client engagement is often overlooked and design can become secondary to the implementation. Often exploring many innovative methods to provide an engaging pop-up shop design or exhibition design and layout, JUSTSO understand balancing requirements and managing budget, when it comes to temporary ﬁxtures. In a time of social media, and increasing difﬁcultly to stand-out in the retail environment, we feel it’s important to consider design and customer experience to ensure successful results in your pop up environment. We will work with you to fully understand the aims and objectives of your project. Our retail architects will create a pop-up space that is designed to grab attention from the exterior, driving customers inside, and encourage engagement with the brand while browsing instore. With a wealth of experience in creating exhibition designs, our team become fully immersed in your brand, delivering exhibition layouts and features that are structured to drive footfall and allow clientele to truly engage with your brand. From the conception of the project, through to installation, we are dedicated to ensuring that the delivery of your exhibition designs is a smooth and stress free process. In a retail environment with an abundance of choice, your pop up shop window displays are key to creating a buzz around your brand. Our visual merchandising team can work with you to create dramatic displays, from digital solutions to telling brand stories by way of illustrations, we create displays that ensure that your temporary structures will stay in your customer's mind on a permanent basis. [post_excerpt] => Utilising a pop-up or, exhibition can be an innovative platform to create drama around your brand. But, consideration of the client engagement is often overlooked and design can become secondary to the implementation. In a retail environment with an abundance of choice, your pop up shop window displays are key to creating a buzz around your brand. Our visual merchandising team can work with you to create dramatic displays, from digital solutions to telling brand stories by way of illustrations, we create displays that ensure that your temporary structures will stay in your customer’s mind on a permanent basis.